Champa Devi, a 30-year-old woman from Maharajganj district of Uttar Pradesh, who belongs to a Dalit community, till recently did not have a permanent roof for her family to live under. She stayed in a small mud hut with her husband and 8-year-old daughter. Life was full of challenges. “During the rainy season, our hut would get flooded with rainwater, making our life miserable. Most of our time was spent protecting our belongings from rainwater. My daughter couldn’t even go to school during this time,” Champa recounted. 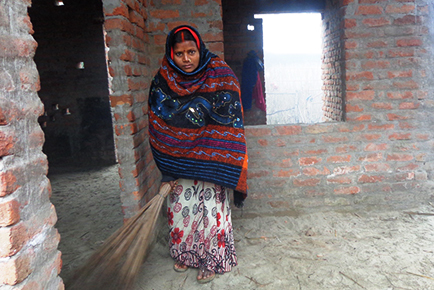 Life for Champa changed after she joined Musahar Manch, a community-based platform formed in Maharajganj with support from ActionAid India and its ally, Musahar Sewa Sansthan (MSS). Musahar Manch works to help musahars, one of the most marginalized Dalit communities, access their rights and entitlements. “At one of the meetings of Musahar Manch, I got to know about the Pradhan Mantri Awas Yojana that provides pucca houses to families like ours living in kutcha houses. Subsequently, with support from ActionAid India and MSS, I submitted an application for a house,” narrated Champa. However, her woes were not to end there. The housing department officials started demanding a bribe for sanctioning her a house. But she refused to pay. With support from ActionAid India and MSS, she thereafter filed a complaint to the higher officials in the department. “The officials took serious note of my complaint, verified my documents and finally approved a house for me. I am happy to share that most of the construction work of my house is now over. We are thankful to ActionAid India and MSS for empowering us to realize our rights,” said a beaming Champa. ActionAid India, with support from MSS, has been organizing training programmes to generate awareness on rights and entitlements among the community, including on their right to housing. As a result of this sensitization and the continued advocacy by Musahar Manch, nearly 370 families have been able to get houses under the various government housing schemes and about 150 families have received financial assistance for constructing their house. That’s not all – members of the musahar community are now empowered to assert their rights to land, livelihood and to quality education for their children!